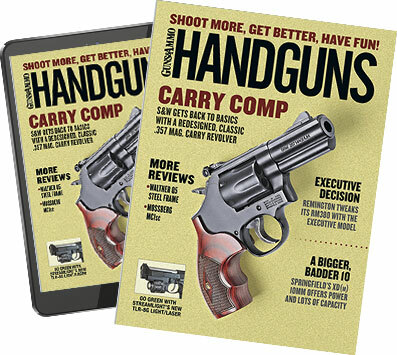 If or when you decide to legally carry a handgun for self-defense and after deciding on a particular model to suit your needs, you have one more decision to make: to carry or not carry spare ammunition, i.e., a reload. I've found this to be an interesting question to ask of the numerous professionals I know who have gone or currently do go to bad places filled with bad people who will kill them if the opportunity presents itself. Some, now retired, still go loaded for bear while others are quite comfortable with almost any handgun and no reload. I've gone back and questioned both groups, and, to a man, when pressed hard on the subject, they will admit that whatever is going to happen is going to be solved with what ammo is in their gun. Then some will quickly add that having more ammo is very comforting for the exception. The decision to carry spare ammo is often based on whether the person perceives a real need for a gun at all. Obviously, the what, when, where and why of locale drives the answer to the question of whether to carry spare ammunition. For someone who simply wants to have the means of self-defense "just in case," he already has the belief that he probably will, at worst, have to display his handgun or indicate that he is armed with one, so the concept of carrying additional rounds is the furthest thing from his mind. And if he does entertain the thought, it would be quickly dismissed as unnecessary or idle fantasy. For others who are, by job or circumstances, thrust daily into the worst areas of civilization, the oft-repeated axiom of "one gun is none, two guns are one" becomes the operative mantra, with lots of spare ammo (and probably more guns) carried as well. In some large cities that also have particularly violent sections it is not unusual for some lawmen to carry up to four handguns while working and spare ammo for all of them (with long guns in their vehicles as well). These folks think they are going light when off duty by downloading to "only" two guns. They are also responding to crimes--"running to the sound of the guns." Their practices are not those normally encountered by the legally armed citizen. In both of these extremes, the often visceral driving force is how they have perceived the amount of danger and made the necessary mental and physical accommodation to come to terms with being so threatened. As I see it, carrying lots of guns and ammunition with the thought of using all of them in a non-law enforcement encounter is, most kindly put, wild speculation. Doing so, though, is mentally comforting since most folks subscribe to--and I can't argue with this--the thinking that "more is better." Besides, if doing so does make you comfortable, and you are then more self-assured (not acting like a victim), then, arguably, the extra baggage has served its purpose well. I do see two very defendable reasons for carrying at least one spare reload. The first is that all guns can and will malfunction or jam sometime. With semiauto pistols, the overwhelming cause of these is a defective magazine or one not fully inserted. All but one feedway stoppage lend themselves to a simple malfunction-clearing drill. Larry Nichols, rangemaster of the Burbank, California, P.D., has long recommended only one malfunction-clearing drill, which is to unload and reload the gun. As I understand, after dumping the first magazine, the slide is vigorously worked at least twice, then a new magazine is inserted and a round chambered. This clears almost all jams (a loaded round or empty case reversed and chambered is not as clearable), but his advice only works well if the original magazine is discarded. Revolvers can also fail to function due to defective ammunition, lack of or improper cleaning or the gun beginning to disassemble itself. Bad ammo is not as common now as it was years ago, when a cartridge might well have a high or protruding primer. As the cylinder turned, this movement would then wedge the bad round between the rear of the cylinder and the recoil shield. Factory ammo is made to higher standards these days, but some revolvers are now made using ultra-lightweight materials. So, while making the gun easier to carry, this combination of light weight and recoil can cause a bullet to be partially pulled from its case while in the cylinder, thus protruding enough to stop the cylinder's rotation. A dirty gun can have debris in between the crane (holding the cylinder) and the frame as well as beneath the extractor. Junk in these locations prohibits the parts from fitting closely to each other, as they are designed to do. When the crane or the extractor is in this state, the gun will be hard to cycle through the firing stroke or might not cycle at all. One other nasty revolver jam happens when a loaded or empty case slips beneath the extractor, usually while the gun is being unloaded. This is caused by failing to operate the extractor firmly and quickly, which can allow the round to slip off. This one pretty much shuts down the gun since the case has to be picked out with your fingertips or a pointed object. While revolvers have a well-earned reputation for working despite neglect, they are not infallible. If screws and extractor rods come loose, the revolver will malfunction, and this condition is not field-repairable--at least not in any timely manner. Reloading with your spare ammo will cure the pulled bullet and should also get debris out from behind the crane or beneath the extractor, but it will not correct the slipped cartridge or tighten loose parts. There are no immediate-action drills that will fix these, nor any drills that clear what is a terminal malfunction in a semiauto: an inverted round (empty or live) chambered backward. There's just nothing for the extractor to grab. One last good reason for carrying spare ammo is one so obvious that I failed to include it in my notes for this column--thanks to Brian Dahmer, a fellow practical shooter, for revealing this forehead-slapping moment. He replied to my query about carrying spare ammo by observing that in the event the handgun is fired, it just makes too much sense to not reload the gun "afterward," for the fight might not be over. For instance, think of Bruce Willis in the first Lethal Weapon movie. He's embracing his wife outside the destroyed tower with all the bad guys now dead and is surrounded by police and onlookers when one of the "dead" bad guys rises up and tries to shoot him; he is instead shot by Willis' officer buddy. Hollywood teaches many poor tactics and gun handling, but this time the writers got it right. The officer was portrayed as alert and dialed in; he finished the fight--in the "afterward." Too bad he didn't then do a reload.